In this tapestry, we see the bridesmaids based on a scene of "The Ceremony" designed by Burne-Jones. This work shows the three bridesmaids which accompany the bride and musicians. As usual, the attention to the flowing garments, the flourish of leaves and foliage on the ground and the shaded forest behind them which just capture some of the light, is evident in William Morris tapestry designs. The maids here are holding baskets and handfuls of roses in preparation for the ceremony. Some beautiful headpieces complete their costumes for this special event. 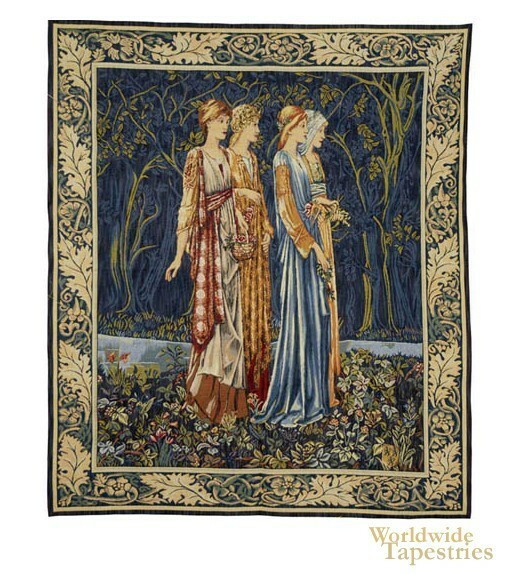 This tapestry "The Bridesmaids" is backed with lining and tunnel for easy hanging.